Average garden soil with excellent drainage. Annual dianthus tolerates light frost with ease, but can be damaged by hard freezes. Encourage fast growth by mixing a balanced organic fertiliser into the soil before planting. Thyme. 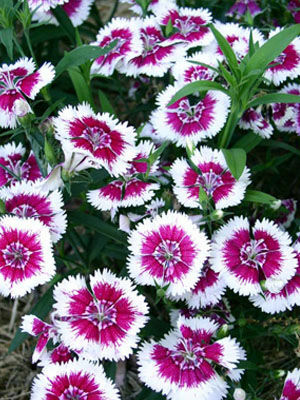 Dianthus combines well with other cold-tolerant annuals including pansies, cineraria, and ornamental cabbage and kale. Set out stocky seedlings in early spring, or in autumn where winters are mild. Our Garden Planner can produce a personalized calendar of when to sow, plant and harvest for your area. Dianthus blooms earlier than other annuals, and well-sited plants may persist for two years in areas with mild winters. Colours include pink, red, lavender, white and many bicolours. Some varieties have stems long enough for cutting. As flowers fade, snip them off with scissors to keep the plants looking neat. Both rabbits and deer like to nibble dianthus foliage. In summer, spider mites cause occasional problems and can be controlled with insecticidal soap. Cram More Into Your City Vegetable Garden!